Cotton Patch Politics: Democratic Party booth at the Georgia National Fair is buzzing with visitors....! Democratic Party booth at the Georgia National Fair is buzzing with visitors....! The Democratic Party booth in the McGill building at the Georgia National Fair (Perry) is just buzzing with visitors. It has turned out to be a big success. Candidates who have not visited the booth yet & would like to visit, please contact Kathy Bird at kathykb510@aol.com Use of the booth is already paid for by the GADCC and is being maintained by Houston County Democrats and Middle Georgia Democratic Women's Club. Candidates can use it free as a meet & greet point. We welcome you! People appear very interested in talking to our candidates!! We ran out of Houston County Democratic flyers & I have to get some more printed tomorrow. 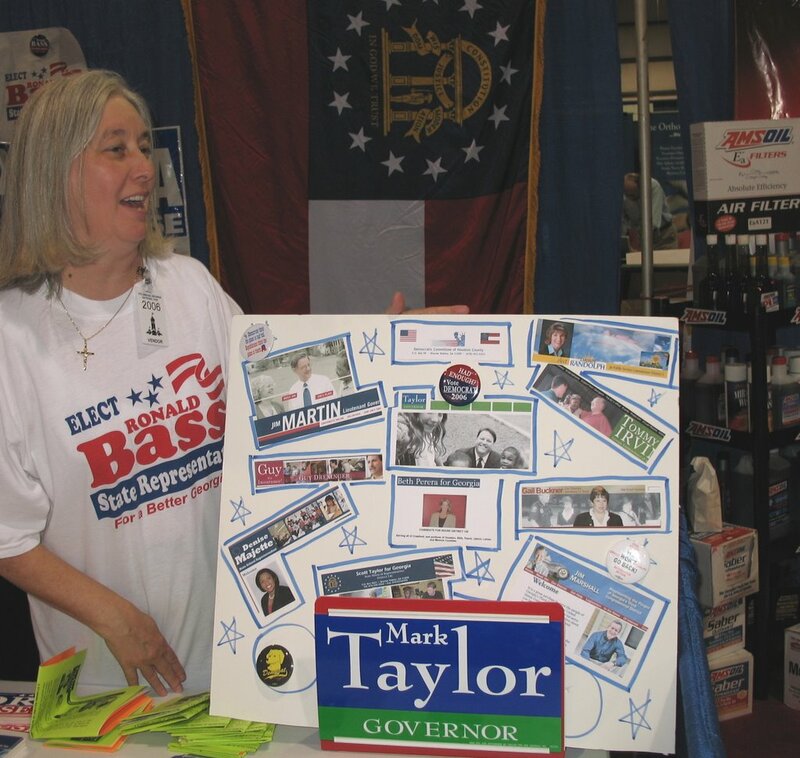 You can also place material about your campaign at the booth for people to pick up. Today (Sunday afternoon) house candidates Dee Yearty, Scott Taylor, and Beth Perera were all three present, and many people stopped to talk with them. All three will be making return visits. As you know, throngs of people are visiting the fair from all over the state. Scott was passing out ice cream bars, which made him extra popular! House candidate Ron Bass was at the booth on Saturday and there was a lot of enthusiasm then too. What crap that Georgia Democratic Women haven't bollocked the entire national political scene by hewing idiotically to Cathy Cox as she ruined the Democrats' response in south Georgia by not supporting Mark Taylor. Childish, idiotic? I don't know and can't imagine what would actually be worse, frankly. Shame on all of us. We deserve nothing, as the country moves on. Thanks, Cathy, and all the rest of you fools.